The CSA from Hubbard Heights Farm is different than most subscription food programs. That’s because its fields lay smack dab in the middle of the hustle and bustle of Stamford, the state’s third largest city. Consequently, most subscribers live within a few minutes of the farm, so it’s easy to drop by and watch their groceries grow. Convenient access also allows people to customize their weekly supply of just picked vegetables, greens, and flowers. “We don’t have to transport the boxes to a central pickup point like most CSA’s,” Brown points out. That allows subscribers to personalize their portions. In fact, they can even go into the fields and pick their own food. “It doesn’t get fresher than that,” Randy adds. It’s not just families who rely on the farm. Restaurants also serve Hubbard Heights’ bounty to their customers. “I divide restaurateurs into businessmen and artists,” Brown confided. “ Cooks like a Michael Marchetti of Columbus Park Trattoria care about the quality of food they prepare for their customers, not just profits. “ Since Hubbard Heights sits at the edge of downtown, this is about as close to locovore cooking as an urban restaurant can get. It’s the quintessence of farm to fork. Brown expects a bountiful crop for his subscribers this year. “There’s nothing a farmer likes better than a cold hard winter,” he confessed, slightly apologetic. The deep snow means the soil will be especially moist and the extended freezing temperatures limit the insect population. Tomatoes are the piece de resistance of his CSA package. Because Randy grafts the seedlings (domestic and foreign) onto disease resistant roots, he organically grows over 20 cultivars of rare heirloom tomatoes. The resulting fruit is so delicate it can’t be shipped, so you won’t find these species in a supermarket. Bite into one, and taste the sugars we savored as kids, once upon a vine. Though the offerings change from June through October, Brown supplies steady portions of leaves for salads all season long. Winter squash, easily stored, also provides a constant. Because the farm abounds in flowers, most boxes throughout the summer and fall are adorned with fragrant bouquets. Brown assures us there are subscriptions remaining, but cautions they should sell out fast. The Farm is located at 202 Hubbard Avenue in Stamford. 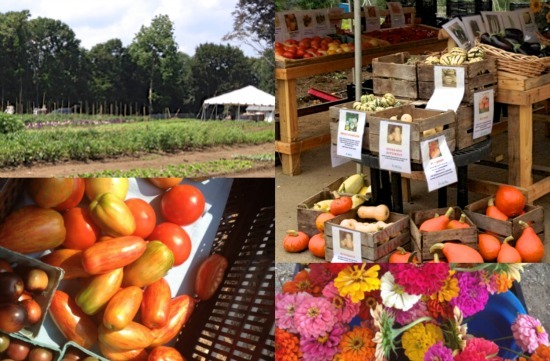 In season, the Farmer's Market opens Tues-Fri 2 p.m. - 6 p.m. and on weekends from 10 a.m. Though tending the farm is totally voluntary, getting your hands dirty is welcomed and appreciated.